In the Bible, windows are mentioned in connection with the building of the temple (narrow light-openings). In the Book of Isaiah there are windows of agate (before glass sheets of agate, alabaster, marble or fancy grills were used); and in the Book of Acts we read how a sleepy young man fell from an open window during St. Paul’s long sermon. Malachi tells how God will pour blessings from the windows of heaven on those who honor them with their tributes. The stained-glass idea came to Europe from the countries of the Middle East. The earliest colored windows recorded appeared in the 800-900’s A.D. The oldest existing ones (1000 to 1200 A.D.) are in the cathedrals at Augsburg, Germany, and Chartres, France. When most European peasants were illiterate, and Bibles were scarce or non-existent for the masses, the pictured windows served to educate and remind the people of Biblical events and characters. One of Rev. Wally Wadland’s most memorable sermons was presented in the early summer of 1986. 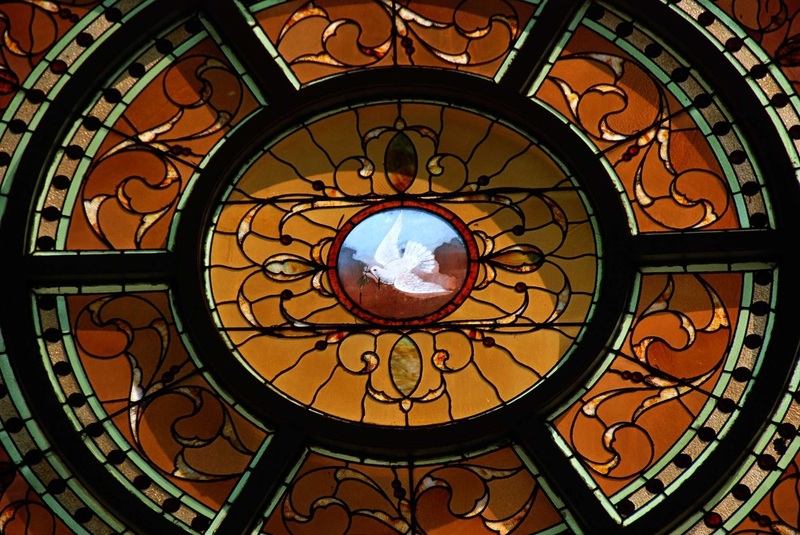 Its topic explored the symbolism and meaning of the various stained glass windows at Poland Presbyterian Church. The following is abridged from that sermon with slight modifications. We start with a representative from the Old Testament. In memory of Mr. and Mrs. J.L. Mauthe (1890-1967), this window shows the great Hebrew leader and lawgiver in all his qualities of seriousness, firmness and purpose. We need especially to examine the tablets of the law of God. Here they are very small, showing only the first words of each commandment. If the whole text of these laws were to be shown, the tablets would have to be much higher and wider. The artist must have copied the Hebrew printing from a synagogue or temple where they only show the beginning of each law. The arrangement is different from the Protestant one you learned. Looking first at the half-tablet on your right, the short line has the beginning of "I am the Lord your God, etc." Commandments 1 and 2 are combined into one, for reasonably so, they are much alike. The next laws follow below. Then on the left half of the tablet you see the first words of the last five commandments. In our version, no doubt you are aware that the first four commandments have to do with our relationship to God; the last six outline our right relationship to other human beings. In this connection, though this window’s coloring and design are not in the traditional style, they might serve to illustrate the important place of divine law in our contemporary, problematic world. 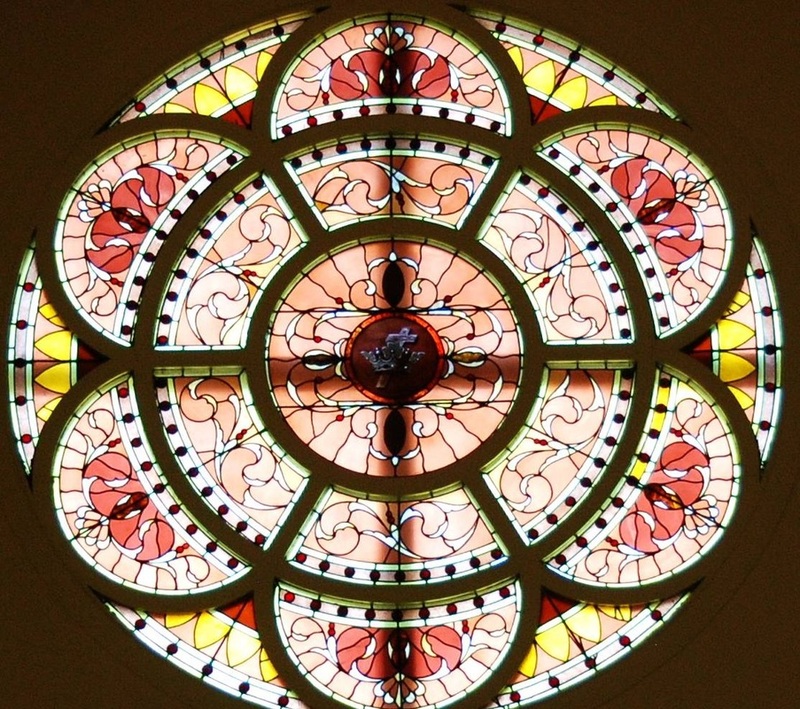 In many churches, including ours, the rose-like window is the focal point for worshipers. It is a stunning window and the first having to do with the life of Christ. When Jesus was baptized in the Jordan River, the Gospels tell us that the Spirit of God descended and rested upon him like a dove, and a voice from heaven declared, "This is my beloved Son in whom I am well-pleased." For many of us, the dove portrayed here may also represent the dove in the story of Noah’s ark, how this gentle creature finally returned with the olive leaf to indicate the waters receding and the promise of new life returning to the earth. Doves have become the emblems of peace and hope in our own lives and our troubled world. This set of side-by-side windows, three depicting symbols and two for decoration, is in memory of the Rev. Dr. Algernon McMaster. At the left edge, a window shows an anchor. The writer to the Hebrews says, "This hope we have as an anchor of the soul, both sure and steadfast." The right-ended window contains a sheaf of wheat. In Psalm 126 we read: "They that sow in tears shall reap in joy." And Luke writes, "The harvest is great but the laborers are few." The white lilies in the center window refer to Christ’s resurrection. Twelve flowers perhaps stand for the twelve disciples, with ruby-red discs in the outer corners for the four Gospels. The other red discs throughout the five windows are left to imagination: a group of 5 for the Pentateuch (Genesis through Deuteronomy), ten for the Commandments, eight for eight days of Purim, and so on. Continuing with the motif of peace and hope, here we see the olive leaves within a medallion, surrounded by attractive bronzed pebbled glass and opalescent sections. This is one of the original church windows. Our Lord often found rest and relief in the Mount of Olives in Jerusalem. In the nearby Garden of Gethsemane he agonized over his destiny. Yet amongst the beautiful things of God’s creation he found peace, accepting God’s will for his life, even death for the sake of his people. He found victory, symbolized over the years by crowns of olive and laurel leaves. Louis Tiffany, (1848-1933), developer of the famous Favrile glass, brought he large-painted picture window to its highest point. This example in our church has protective glass both inside and out. People ask about its value. No price can be given as it is truly irreplaceable. You should notice that unlike most other windows, there is no border. It is a canvas-like painting in rich somber colors and shades, extending unbroken from edge to edge. In memory of John Arrel, (1773-1848), Poland pioneer, a founder and charter member of this church, the window’s portrayal of the Good Shepherd varies from the usual as here, the artist chose not to place lambs in the shepherd’s arms. The sheep watch him as he leads, assures and blesses them. (Psalm 23; John, Ch. 10). His figure is shown in ivory-white opalescent glass, surrounded by rich, verdant pasture, trees, and brook. His staff provides added assurance and safety. While he shows the way, it is our responsibility to respond and follow as members of his flock. This rose-window carries out the crucifixion theme, portraying the intertwined cross and crown. Here the emphasis is on the relationship between acknowledgement of the cross and the blessings received from it, made possible for us through Christ’s life and sacrifice. Paul writes, "Henceforth there is laid up for me a crown of righteousness." The ancient Greeks had a "stephanos" which was a garland worn on the head of a victor in a contest. The crown of mockery placed by soldiers on the head of Jesus stood for defeat, but he turned it into victory. 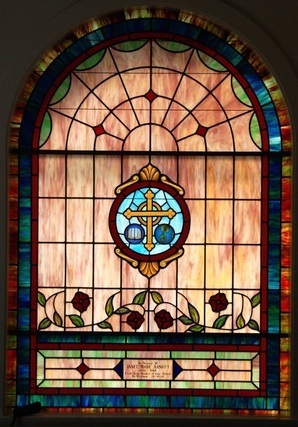 This recently installed window in the entranceway is in memory of Janet Arnott (1920-1984), late member of this church. We see a maximum of vivid, luminous colors with a limited amount of painted delineations. The central motif shows a large circular band in gold, enclosing a ruby cross above a Bible an a part of the earth, North and South America. The background is in lighter opalescent glass for contrast. The circle, the symbol of eternity and the world, reminds us that the cross of Christ is for the world. The message is for our good and forever. Underneath all this there is a horizontal line of red roses and leaves, no doubt representing the sacrificial blood of Christ and the beauty of his unselfish life. 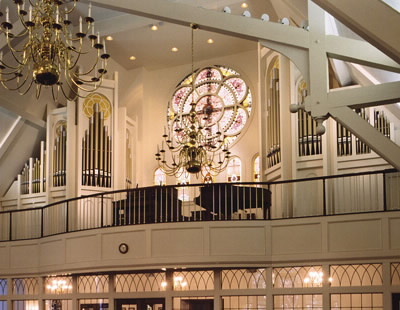 The custom-made Holtkamp Pipe Organ was installed in the sanctuary in 1999. Craftsmanship, integrity of architectural design as well as beauty in sound make the organ a majestic medium of grace in the church’s worship. Click here for more information from the Holtkamp Organ Company regarding the organ’s installation.